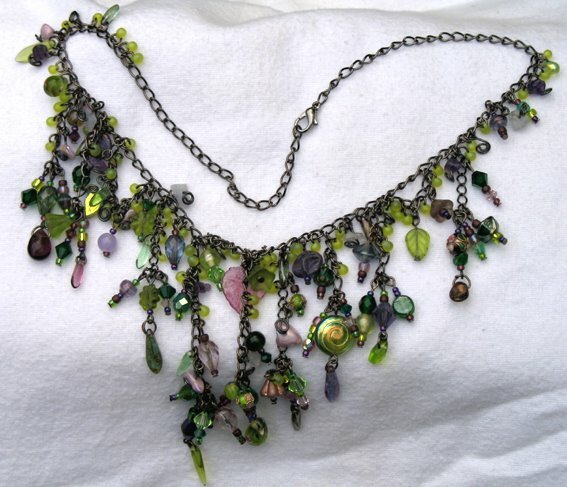 The detailed shot above shows the amount of beads that has gone into this necklace. There are more different beads in there then I could mention without putting everyone to sleep. Enough to say it took a long time to put together and I've used very few beads more than once (mainly seedbeads and Magatamas). 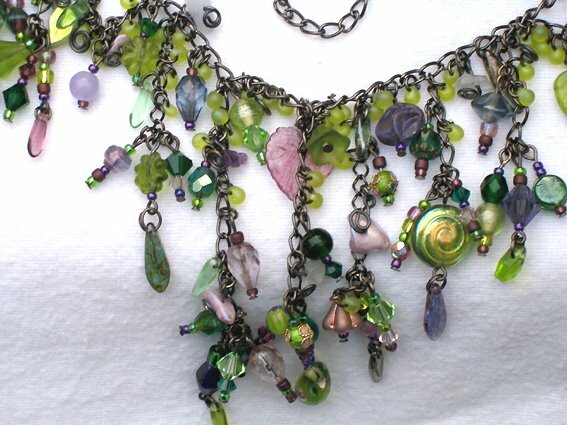 Okay, I'll mention a few: Czech faceted beads in emeralds and greens, Picasso beads in lilac and lavender, Giverny beads in moss greens and purples, Cloisonne beads in green and purple, lots and lots of Swarovski bicone beads in emerald, peridot, amethyst, and light amethyst, real amethyst and lace agate, and plum coloured lustred stone chip beads, loads of glass beads in all shades of green and purple, seedbeads, and daggers and drops. HOWEVER, don't despair, I am going to make more in this range. 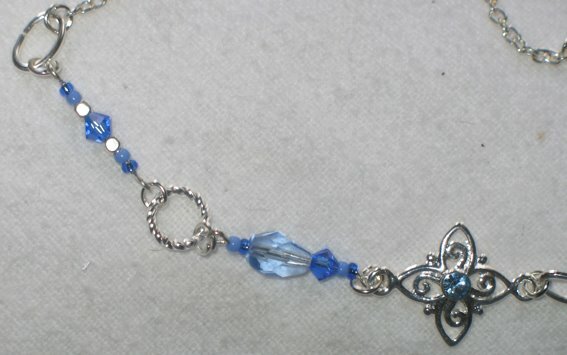 I've already decided to make one for Titania, Queen of Fairy, the Snow Queen, and Undine. There is also a very vague idea to make one for the Queen or Goddess of the Night, Selene, and possibly one for Isis. I am sure I can think of more. Any suggestions are welcome. 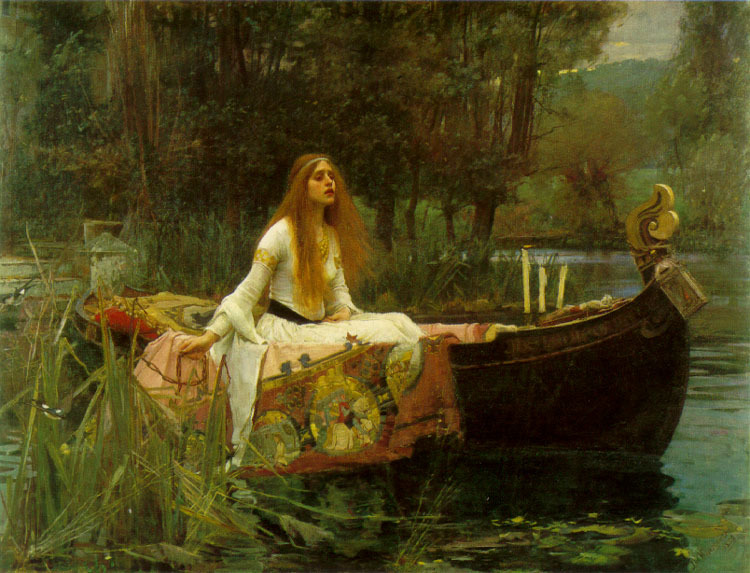 Don't hold your breath, though, as the Lady of Shalott took me around 4.5 to 5 hours to make. I've been busy sorting out my jewellery bits and pieces and got some new storage, which is a nice thing to do because whilst sorting through the whole of it you see what's actually there and come up with new ideas. 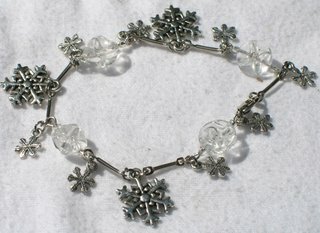 Ice - another necklace for my winter collection. The picture doesn't do it justice, however it's very difficult to photograph white/clear beads. 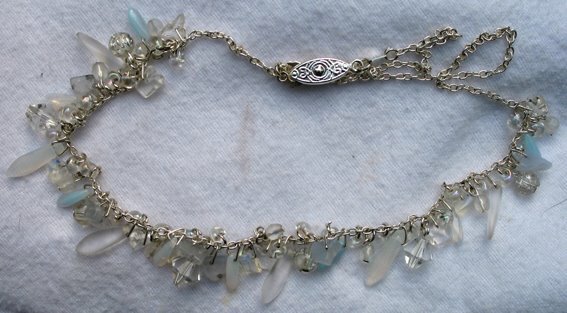 I've used several different types of daggers and drops, including Magatamas, Czech facetted bicones - clear and frosted, lace agate, rock crystal, and moonstone chips, and a few glass beads (cracked glass and clear). 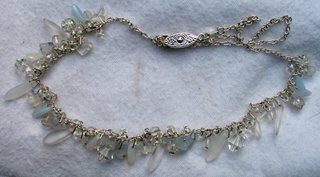 The necklace is strung on a very thin silver plated chain with a pretty clasp and it sparkles and glitters like bits of ice in the sunshine. 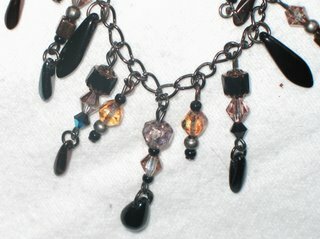 All of the necklaces in the range are strung on black plated chain with black plated findings. The first one reminded me of Egypt it's therefore called Nile Jewels. 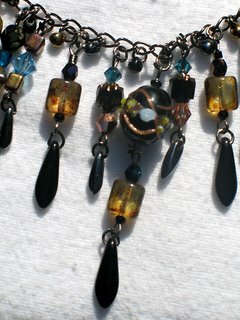 The centre bead is a beautiful black Venetian bead with gold and blue decoration. 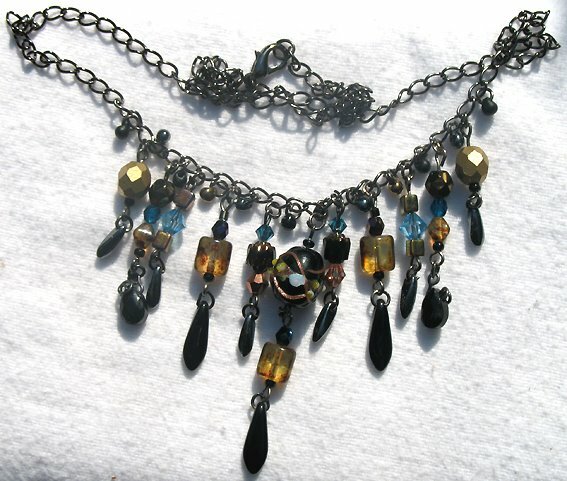 I chose the rest of the beads to match this one and they range from lustred Picasso beads in a golden amber to black/gold cathedral beads, gorgeous turquoise Swarovski beads to vintage glass beads and Japanese Magatamas. 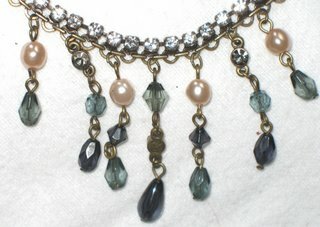 The second necklace in the Jewel range reminded me of the Middle Ages. 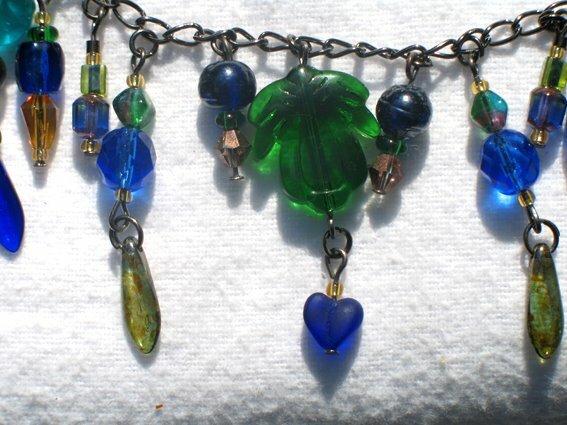 Not sure if it was the centre bead (the leaf) or the colours, but it's medieval as far as I am concerned, so I called it Medieval Jewels. I've mixed different types of beads in greens, blues and golds. The effect is quite stunning and will work perfectly on pale winter skin. 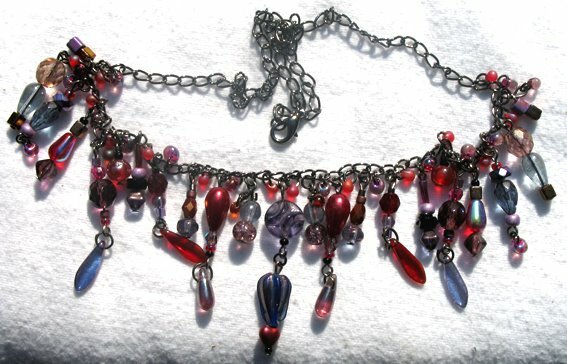 The final necklace is all in reds and purples and the combination reminded me of old Renaissance paintings. 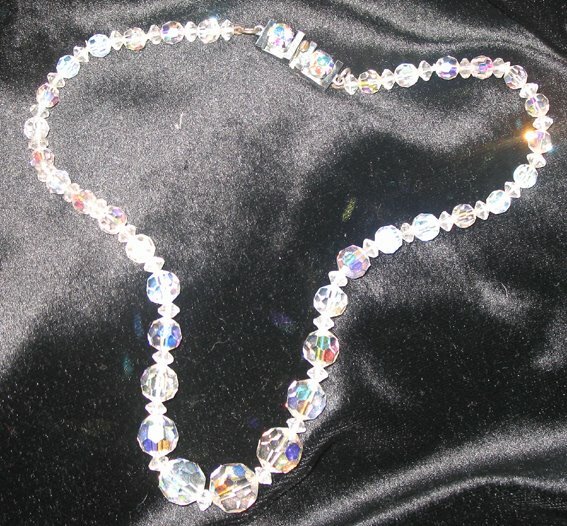 It's therefore called Renaissance Jewels. I've used all sorts of different beads in deep reds and purples with a few lighter mauve and lavender beads amongst the darker ones, and Magatamas in fuchsia and frosted lustred red to bring it all together. A few items I created recently (as recently as last night) but had not time to showcase yet. It's a delicious necklace made with real amethysts (chips and oval beads), faceted, twisted, and plain glass beads, a few vintage beads and seedbeads, my favourite Magatamas (in lilac in fuchsia AB coated), and as a centre piece a little pale lilac heart, all threaded onto black plated chain. These earrings are really sparkly and lovely. The jade green spears are the same as I used in the "Bamboo" set (check out the previous post "Bamboo) and the blue ones are from the same source. 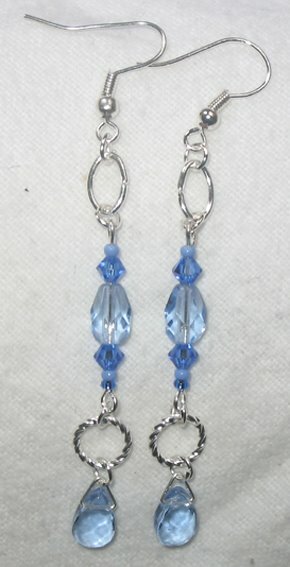 I also used Magatamas in pale blue, Czech daggers and Japanese Myuki cubes. This final set was made (only yesterday) to wear with my lovely silver bracelet from Ventimiglia (see previous post). 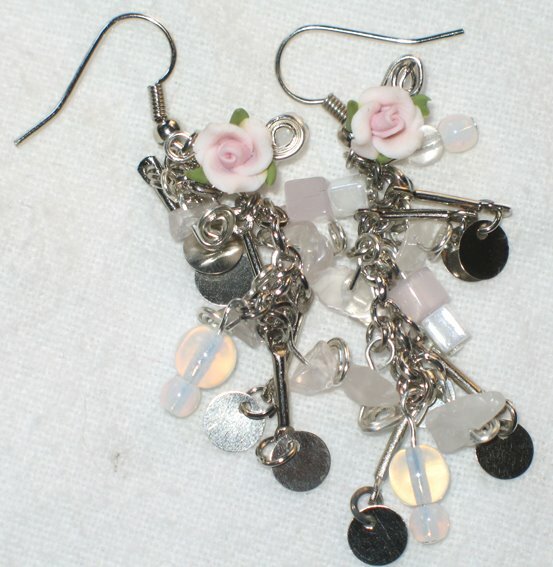 The earrings (below) are made with white catseye beads, mother of pearls chips and a lovely Giverny drop bead which is hung from a tapered connector. 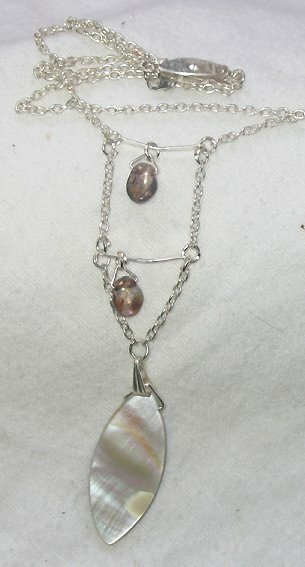 For the matching necklace I've used a beautiful pendant that is made of Mother of Pearl on one side and Abalone shell on the other (see picture at the bottom) which is reversible. I've used the connectors (the same as in the earrings) to hang the Giverny drops from. 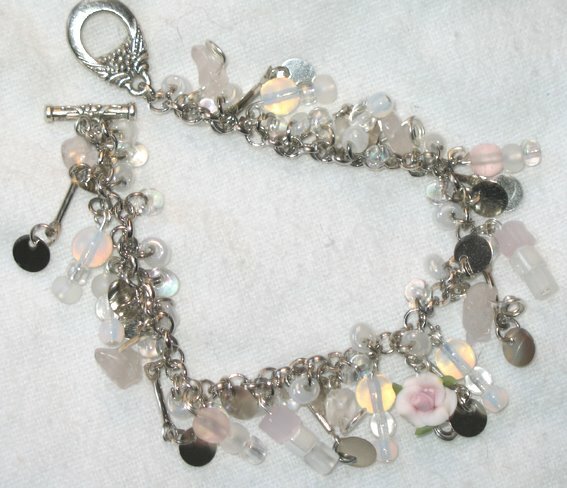 The chain is fine and silverplated with a pretty connector. 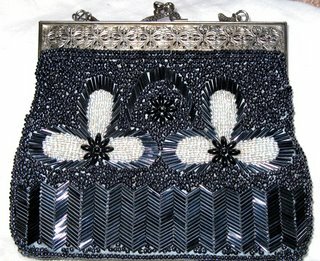 I just couldnt resist this beautiful 1920s handbag. It's all beaded by hand with hardly any wear on it. The lining is near perfect and the handle has wonderful detail on it. I admit, I fell in love with it and it was just one of those things I absolutely had to have or I would have forever regretted it. This one was a real find. I don't normally wear anything remotely gold coloured and this is brass, but nonetheless such a beautiful Edwardian necklace I just had to have it. The brass is tarnished and almost has a silvery/pewter patina which means it looks good despite my reluctance to wear anything gold. 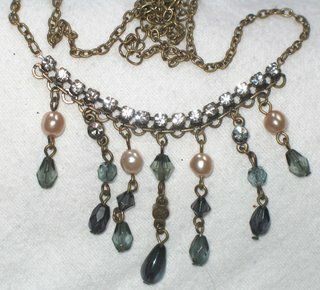 I love the detail on it and the unusual way it uses diamonte, faceted beads and pearls all in one necklace. I wouldn't have thought of using diamonte, pearls and faceted beads in quite this way but the effect is very pretty. This Victorian Opaline necklace is one I will take apart. It's quite long and almost pretty the way it is, but it would need to be restrung as the string is quite fragile and the clasp has Verdis Gris on it and doesn't open and close properly. 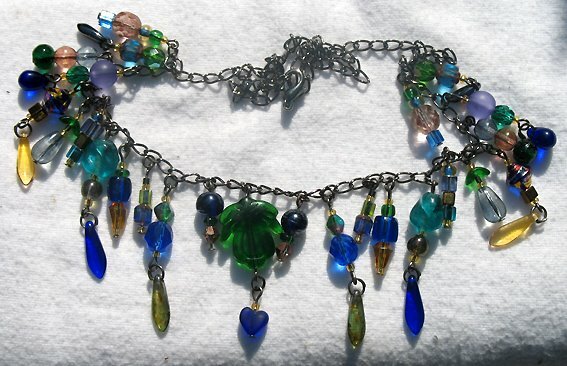 The glass beads themselves are wonderful and rather than the pink or golden glow most of these beads have normally, this one glows in a wonderful blue. It will make some beautiful new jewellery. Watch this space. On a previous visit to another antiques fair I bought the following two necklaces, which one day I will take apart. The first one, the crystal necklace, is too short to be comfortable and I also think quite oldfashioned the way it is at the moment and the beads themselves are really beautiful and would work much better in a new arrangement. The final treasure is the bracelet I bought in Ventimiglia, Italy, on my recent holiday. It was a real find and a real bargain. It's real 924 silver with Mother of Pearl inserts and a fairly modern design. A knowlegeable lady at the antiques fair today suggested that it was probably from the 1960s and another said she'd sell it for 3 (!) times what I paid for it. However, there's no way I am selling it, for starters it's a lovely memento of the holiday (little wave to Alison), it's lovely besides, and very pleasant to wear. Designing your own jewellery depends, in my humble opinion, very much on the materials you choose. 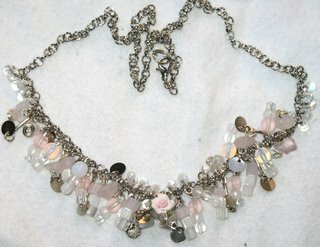 I spend hours scouring the net, shops, antique fairs, and carboot sales for the right beads and findings. 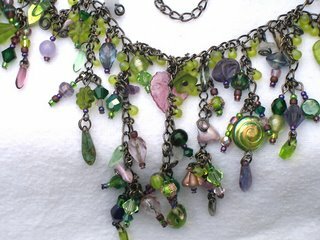 I love using vintage beads in my designs as this is a beautiful way of recycling. I like the idea of using an unloved necklace or bracelet and giving the parts that made it new life by using them in my designs. There are really two parts to this "lesson". The first is buying your materials, the second selecting the materials for each individual piece. If you're buying on the internet make sure you check the description carefully. Beads often look bigger or sometimes smaller than their actual size on photos. The colour is often difficult to tell on a photo as the pictures you see depend on the camera/light conditions when the photo was taken but also on the settings of your monitor. Red is a particularly difficult colour to photograph. Also check the prices. When you are buying on eBay often many sellers will sell the same beads but at different prices. Compare the prices AND the different P&P charges. Then, check the feedback of the person you are buying from. I buy from many different people on eBay, some have become friends over time, others I just buy from once because they have a particular item I especially like. If you're buying in shops, consider that there is usually a higher markup for the shop to cover costs. Some items are still worth buying either because they're special or because you were after a bead in a particular colour/size/shape. Shops are good to see the actual shape and colour of a bead. If you're buying on an antiques fair or carboot sale, choose carefully. Look at the necklace/bracelet/earring and see if it can be taken apart and if you can use readily available findings (headpins, eyepins) to make it part of a new design. Also check the tear and wear on the beads, check if clasps can be reused (often these are quite pretty but have bits missing, e.g. 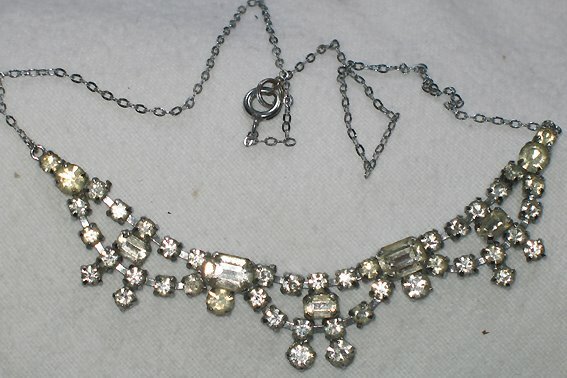 little diamonte beads, that can occasionally be replaced with modern ones). 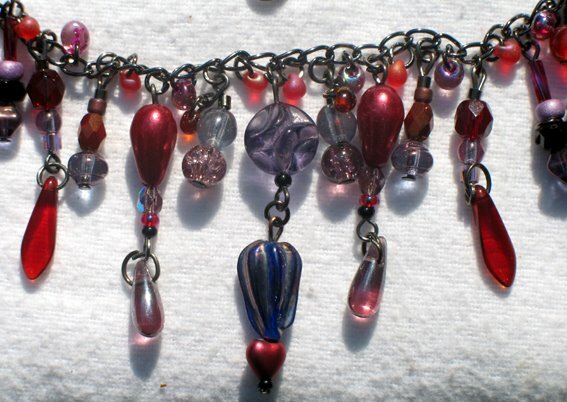 I've managed to find some quite beautiful vintage beads this way. 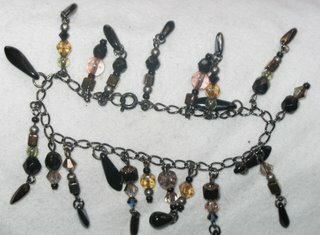 Check out the hair clip I made to see some of them. However, always check the price and roughly estimate what each bead would cost you. Often these are slightly more expensive than their modern counterparts, however they often have a lovely patina which is well worth the extra money. It's also worth trying to haggle. Something you can't do in a shop or the internet. This, in my humble opinion, is the most important stage of every design. Think about your design beforehand. I often have a picture in my mind that I then try and recreate in the design. For example White Water. 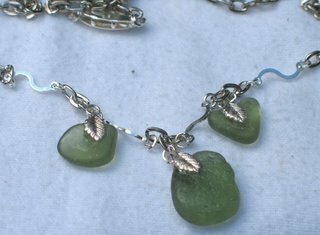 I saw the movement and flow of the water in my mind and then tried to translate the feel of it into the jewellery I was about to make. 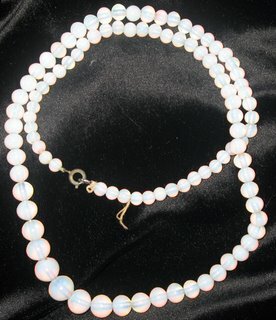 It is very important that your findings and the colours of the beads work together. 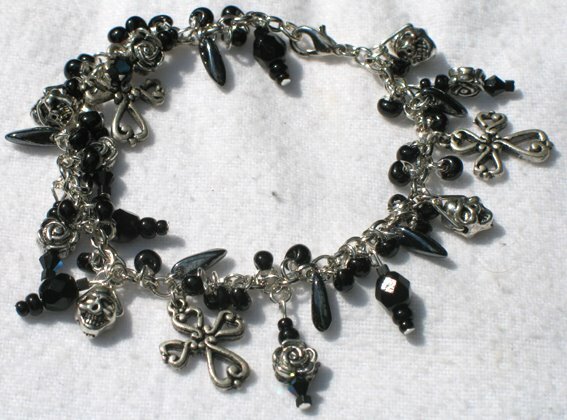 There are certain combinations that always work, black beads and silver findings, red beads and gold findings, turquoise/blue beads and copper findings, etc. However, it's worth playing around with these combinations. I find purple and copper work well together and this combination looks completely different from silver and purple and is much warmer and softer. Choose your beads. Even if you are sure of colour and know how to use it on paper or with fabric, think again. 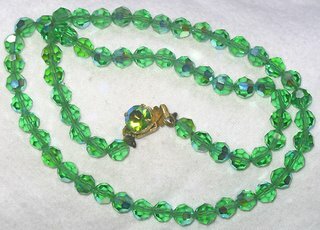 Beads, often faceted, lustred or with other colours mixed in sparkle off each other and, depending on how you combine them, create different effects, often not the desired one. I always lay out my beads on my bead mat before I start putting them on findings. There are lovely bead boards, some with a lid and measurements, that will allow you to lay out your beads into a groove in the board so you can create the necklace/bracelet without the findings and see how it will all work together. The other advantage is that it makes it easier to "centre" a design and to easily design different lengths for bracelets and necklaces without having to measure the design all the time. The final advantage of a bead board with a lid is that you can leave your work in a safe place, e.g. overnight. Get yourself a kit that includes all the findings and beads. You can get nice ones on eBay or in shops. This will let you try it out before you commit yourself. Get yourself a book about colour if you are unsure about the use of colour. You don't have to buy one, but can find them easily in your local library. If you find you really enjoy beading, start of with a few bead mixes in different colours. They will give you something to start with and mean that you don't have to spend a fortune to begin with. Seedbeads are available in a myriad of colours. If you start of with bead mixes, get your seedbeads in coordinating colours. You can get good buys on three or more packs of seedbeads in several colours. Check out eBay for good buys. 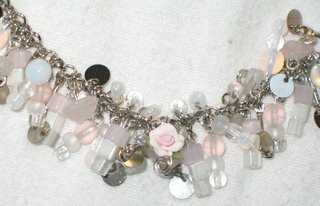 However, a word of caution, the quality of seedbeads varies a great deal. 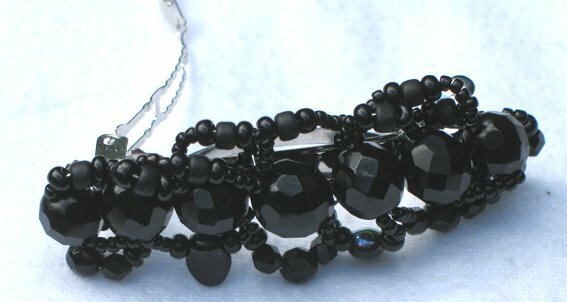 Cheap is definitely not always best as bad quality seedbeads will vary in size and have imperfections. Simply Seed Beads offers a great range of colours in excellent quality Czech and Japanese seedbeads of varying sizes, cube and other small beads. Homebeads is a great place to buy findings in larger quantities. Concentrate on one colour (silver, gold, copper, bronze, or black plated) at first. You can always extend your range later on. Make sure you get the right tools. You need pliers that are smooth on the inside (where you grab the findings) so you don't damage the findings. Some electrical pliers are fine, but check them first. A lot of people sell jewellery pliers at huge prices, instead you might want to try your local DIY shop for electrical pliers that are smooth on the inside as these are often much cheaper. For some designs you will need glue. I use superglue that can be applied with a brush. I found this the easiest one to use as it is simple to apply and allows more control than the ones in tubes or bottles. Look around in shops what you like and see how it's been made. This will give you a great starting point. Finally, check out the net for info on how to make certain designs. 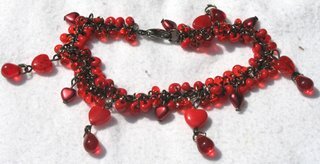 There are loads and loads of tutorials around, written by bead enthusiasts that explain in great detail how to achieve a certain effect or how to do a particular design. 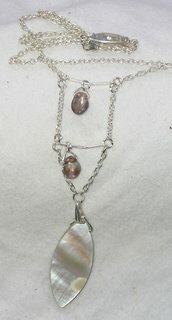 The necklace has been inspired by the jewellery I saw in Nice, using different size links. 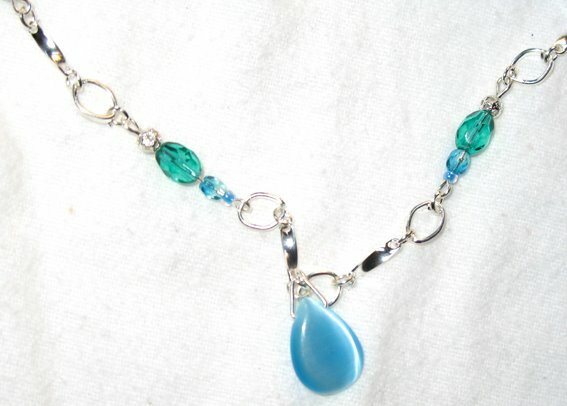 The centre piece is a cool blue (turquoise) drop shaped catseye bead, surrounded by faceted beads in teal and blue, a few shimmery blue glass beads and blue jade beads with a pale blue glass tube and seed beads to bring it all together. There are also some twisted connectors to add interest. Above is a close-up of the catseye bead feature bead. The earrings match the necklace perfectly. 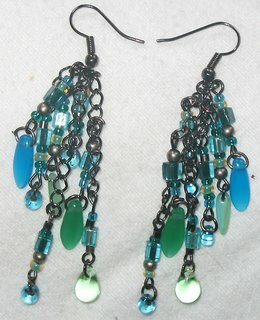 The necklace is very simple so I went a bit more over the top with the earrings. 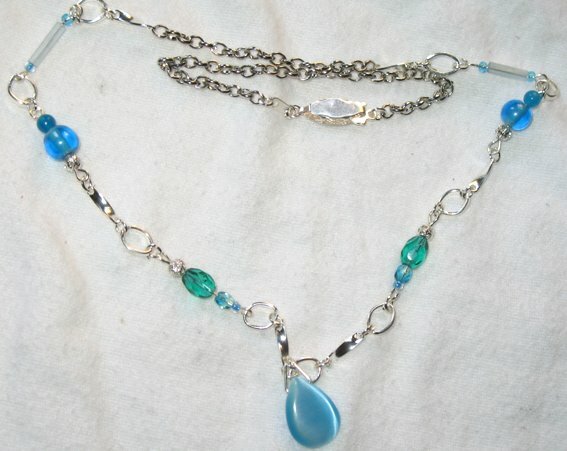 I always try to strike a balance with my sets so either the necklace or the earrings are more elaborate so that one enhances the other, rather than one trying to outshine the other. 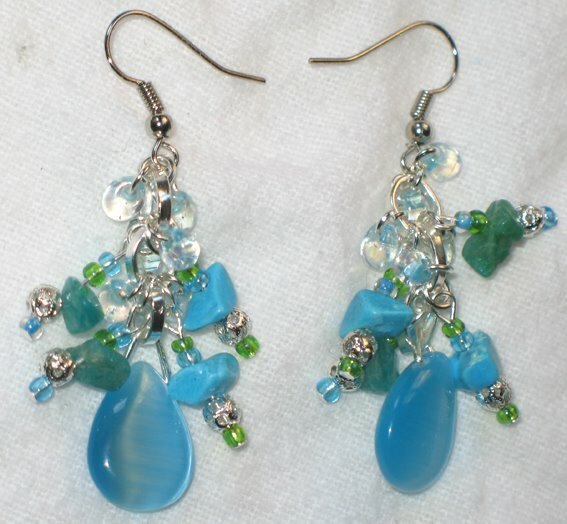 The earrings again include the lovely catseye bead, but additionally have some real turquoise and malachite chips and filigree silver plated and pale blue Magatama beads to make them into something quite stunning. 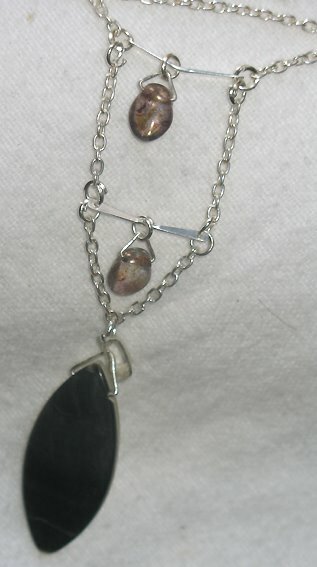 ... can't keep away and can't stop making new jewellery. Had some lovely findings and beads in the post from Rache, my favourite supplier, who also happens to make beautiful jewellery. 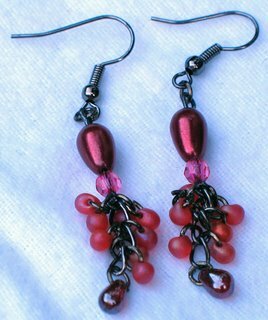 Check out her site here: Rache's Jewellery Supplies. She sent me some gorgeous little roses and also some lovely silver discs which I can't get enough of. They are just so versatile and they add a beautiful sparkle to jewellery. Their effect is very similar to the little mirrors in Indian embroidery. Very neat. 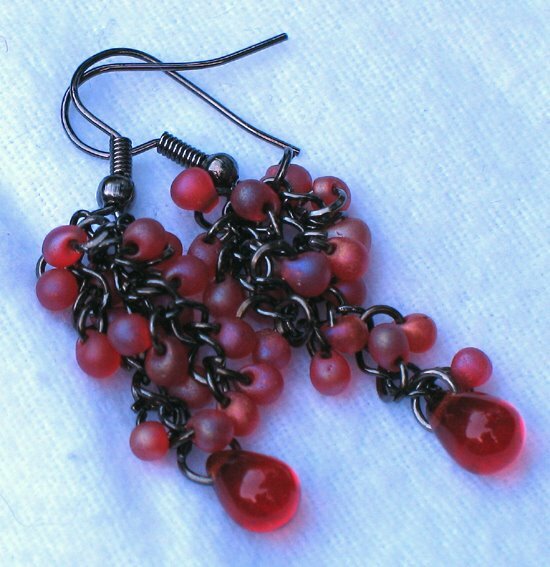 Here are a few bits and pieces I made over the last month which didn't seem to fit in with anything else, mainly earrings. The first set of earrings is in greens and reds and part of my Winter Collection. 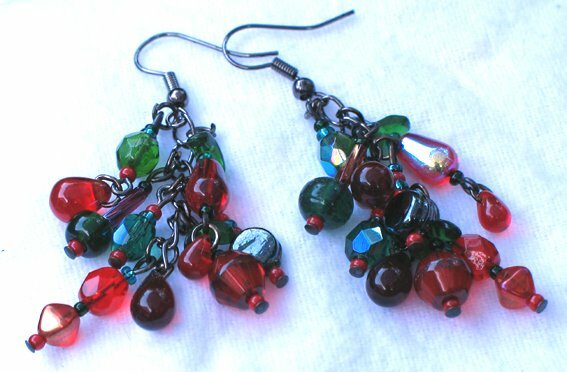 They are very Christmas-y and cheerful with faceted and lustred beads in red and green. 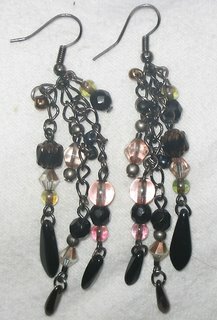 All of the above earrings are on black plated findings. This earring set is another one from my Winter Collection and I'd sold it before it was even put together completely. My friend saw them when she came round for lunch and just had to have them. 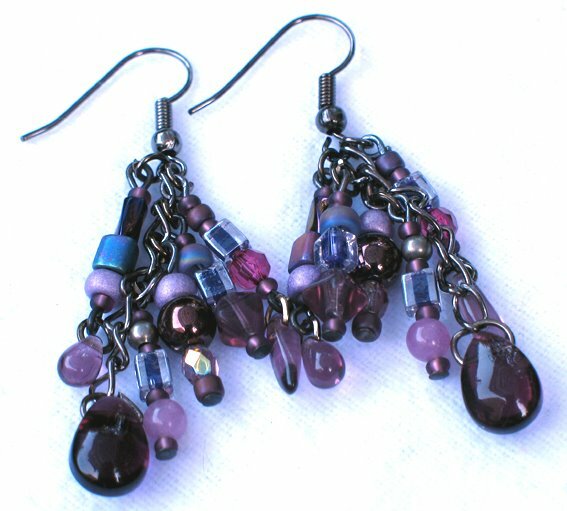 A very special set with lots of unusual beads in different purples. Perfect for this year's wintter fashion. Watch this space for more if your colour is PURPLE. The last month or so I've started work on my Winter Collection. 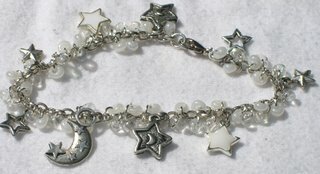 Yesterday was "bracelet day". I've made three very different ones. I've come back from my holiday in Nice a few days ago and a great time we had, too. It was lovely seeing my friend Alison again and finally meeting her two lovely kids. After all the unpacking and getting everything back to normal I was bursting with creative energy and did a couple of necklaces inspired by our holiday. I love the way the alternating big/small links of chain make the necklace look so different and in a peculiar way quite "light".